The scale and cultural impact of the Star Wars franchise means it has a responsibility to make a positive difference, Disney's UK chief marketing officer Anna Hill told Campaign. Two years ago energy supplier EDF decided to boost the number of girls choosing a career in science, technology, engineering and maths (STEM for short). The "Pretty Curious" campaign was noticed – by Disney, which also wanted to inspire girls and happened to have a certain blockbuster coming up in its release calendar for which it was looking to forge brand partnerships. The idea was devised and execued by Havas Media. "Separately to Star Wars, we’re very focused on how we empower girls," Hill said – other outlets include Disney’s "Dream big, princess" campaign – "but we also felt Star Wars was a pretty strong vehicle for that. "We’d done our homework and knew EDF were also very vested in getting girls into STEM. What we can do is to bring a great story to something that can be challenging to communicate." The partnership was underlined with the cinema ad featured above. It also includes an online video series profiling the personal stories of women working in STEM, including at Star Wars studio Lucasfilm, and a series of events for schoolgirls at which they get the chance to design and build their own Star Wars droid. Disney’s smörgåsbord of brand partnerships for The Last Jedi include some with more conventional manifestations: Cereal Partners, Volvic and Coca-Cola have limited edition packaging and on-pack promotions, for example. Philips is releasing special edition razors. But EDF is just one of several based on a more developed integration between the brand and the Star Wars IP. The partnership with eBay has seen two activations demonstrating the bidding site’s distinct retail model. 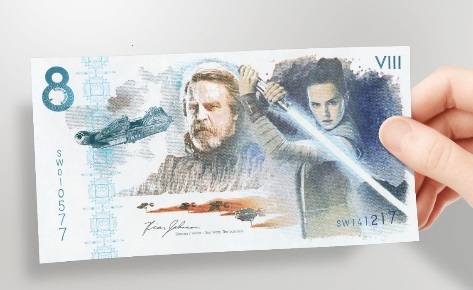 One saw a set of specially-made Star Wars bank notes sold on the site, with 1,000 regular notes going for £100, and 50 signed ones sold through open auction. It raised £185,000 for charity Together for Short Lives, with notes signed by Mark Hamill and Daisy Ridley going for more than £5,000 each. "Raising money through the movie is an obvious space for us," Hill said, "but this is about doing it in a innovative way that will delight the fans." The other was more about highlighting the huge breadth of goods available on the platform – Disney challenged YouTuber Colin Furze to build a lifesized replica of a TIE silencer, a vehicle from the movie, using only parts he could find on eBay. "He created it in six weeks - this enormous structure, seven or eight tons," Hill said. "It was a great way of us using influencers, finding things that work really well for the brand – we created lots of content and over 20 million people have already reached that content." All of these pieces of work reflect a simple condition Hill looks for in partnerships: "It’s got to be authentic and work for the brand." Another aspect of the promotional campaign for The Last Jedi is creating ways for fans to get closer to the film and more immersed in the story. Through its Priority scheme, O2 once again invited 500 die-hard fans to attend the film’s premiere, with around 500,000 applying for a place – twice as many as 2015’s The Force Awakens. And working with The Void, Lucasfilm has created a live experience, "Secrets of the Empire", that Hill promises is "virtual reality like you’ve never seen before". "You move, you get involved in the story," she said. "You get hit, you feel heat. "Bringing new experiences, particularly out of home, that people could do with friends and family was a real focus for us." Hill said she expected that immersive experiences like these would become more and more of an expectation – but pointed to the 2015 collaboration with Secret Cinema as evidence that this did not always mean the use of augmented or virtual reality. "Whether its through technology or just through storytelling, people do want that kind of storytelling," she said. "It will come in more and more guises."